Three debut series from Image Comics, two fantasy and one science-fiction, were met with immediate enthusiasm from readers and received critical acclaim from the press. Among the three was the first issue of ALEX + ADA from Jonathan Luna (GIRLS, THE SWORD) and Sarah Vaughn (Sparkshooter), a science-fiction drama set in the near future about a man who forms a unique bond with an android. In light of its success, ALEX + ADA has been expanded from 12 issues to a 15-issue series. Adding to the excitement, UMBRAL #1, a brand new dark fantasy adventure series from Antony Johnston (WASTELAND, Daredevil) and Christopher Mitten (WASTELAND, Batman) has enchanted fans. This story of a thief accidentally discovering the beginnings of a demonic invasion blends paranoia, magic, and dark prophecies. Chris Dingess (Being Human) and up-and-coming artist Matthew Roberts’ MANIFEST DESTINY has sold out, as well. The newest genre-blending series from Skybound explores Lewis and Clark’s adventures in an untamed Western frontier where monsters lurk in the shadows. These new series instantly picked up momentum and found a strong readership. ALEX + ADA #1, UMBRAL #1, and MANIFEST DESTINY #1 have all sold out at the distributor level, but may still be available in comic stores, and are currently available digitally on the Image Comics website (imagecomics.com) and the official Image Comics iOS app, as well as on Comixology on the web (comixology.com), iOS, and Android. Image Comics is pleased to announce that all three titles will be going back to print to meet customer demand. 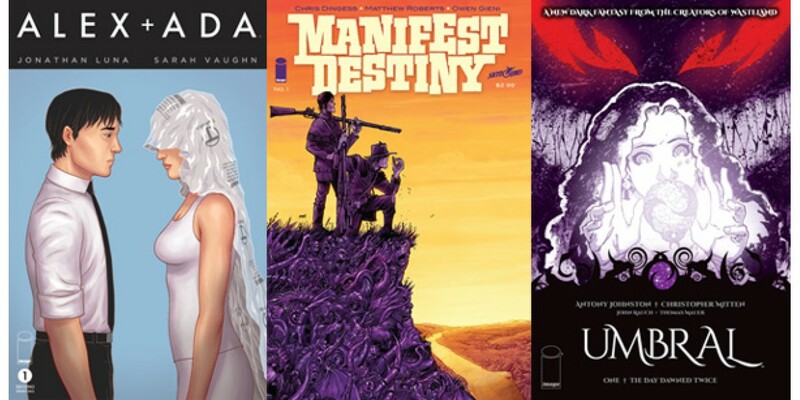 The second printing of ALEX + ADA #1 (Diamond Code OCT138100) and MANIFEST DESTINY #1 (Diamond Code OCT138101) will release on 12/11, while the second printing of UMBRAL #1 (Diamond Code OCT138102) will release on 12/18. ALEX + ADA #2 releases 12/11 and will be available for pre-order with Diamond Code OCT130591. MANIFEST DESTINY #2 releases 12/11 and will be available for pre-order with Diamond Code OCT130608. UMBRAL #2 releases 12/18 and will be available for pre-order with Diamond Code OCT130630.